It has become a bit of a tradition around here for me to create and share valentines for you to use. 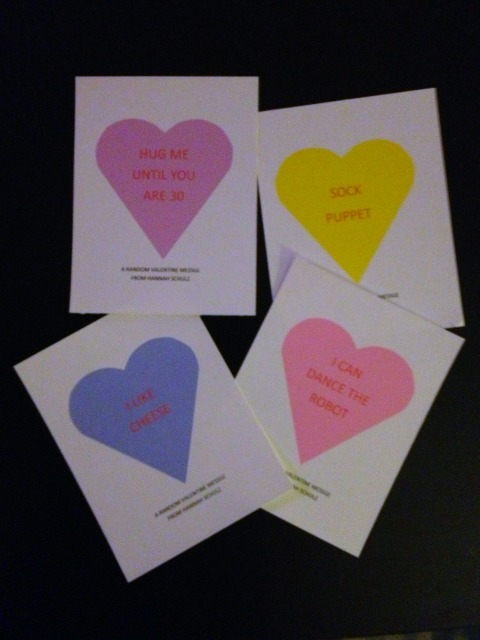 In 2012, they were the vastly popular Doctor Who themed valentines. Last year, I made conversation hearts. I’ve continued the conversation hearts this year (because they are easy I care), with—not just one— but two themes. I’ll be giving the Let Me Put My Cold Feet On You one to Walt. I can’t help it. I’m a romantic. Up next, for the fellow writers among my readers, I’ve designed some cards for you to give your loved ones. I know they will appreciate them. I hope your loved ones enjoy receiving them as much as I enjoyed making them, however unlikely that may be. Happy Valentine’s Day! 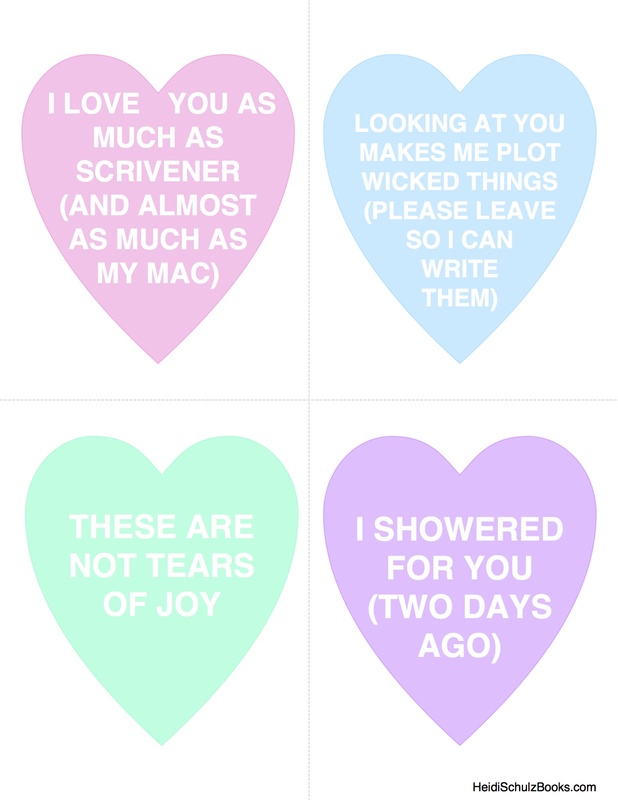 Just popping in to share this year’s Valentines. No mushy love stuff here! Conversation hearts that say: HUG ME UNTIL YOU ARE 30, I LIKE CHEESE, SOCK PUPPETS, and I CAN DANCE THE ROBOT. I’m under no illusion that these will be as popular as last year’s (more than 13,000 views! ), but for those of you who are not Doctor Who fans, feel free to use these instead. Anyone have a jointed-arms Barbie needing a home? She can be ugly, naked, scribbled on, and/or ratty haired. I just need her arms to move. Working on a craft project/Christmas present for Newt. People are fairly used to me being strange, I think. A few days later, a friend dropped off a sad, ugly, nearly naked* Barbie Doll, just begging to be made into something fabulous dangerous. He did not even bother to ask what I would be doing with it. *She was not totally naked. She was wearing a men’s athletic sock. I don’t even know. I looked up a couple of online tutorials for inspiration, but like I generally do, I decided to do it my own way. I don’t like to be bossed around. If you are interested, these are the ones I looked at. Both tutrorials pointed out that even jointed Barbie’s arms need to be cut off and reattached in order to properly cover her eyes. Both tutorials also suggested using a hot glue gun to reattach, but somehow I failed to notice. 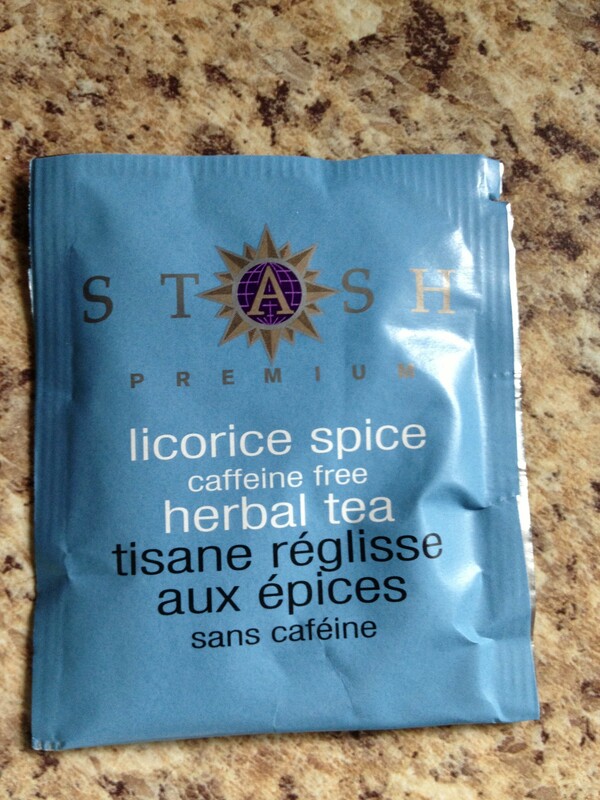 I wish I had–it would have saved me many swears. I should have glued them on nice and tight, then covered the joint with air dry clay. Instead, I just used air dry clay to attach them. Do not do this. If you’ll notice, I also have Barbie in a bottle, which I have glued to a base. 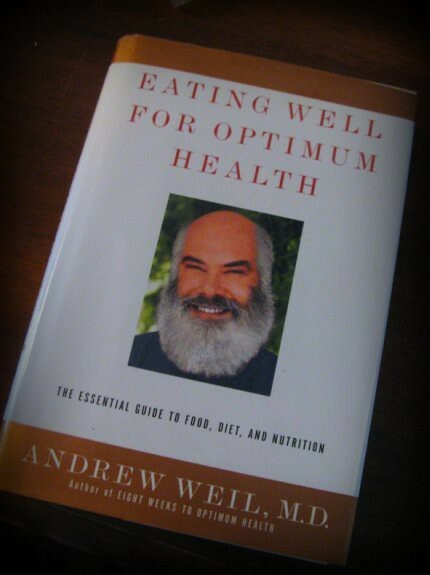 I had planned to use the bottle method as outlined by Creative Crossing but later changed my mind. You’ll see why. Anyway, after giving Barbie some Popeye arms “reattaching” Barbie’s arms, I moved on to her hair. First up, a haircut. I trimmed it as closely as I could, then used tweezers to pull the rest out. Once she was nicely bald, I sculpted new hair with air-dry clay. I used a stylus to create ridges and add texture. Then I got ready to dress the little angel. I used plaster fabric–it is the same material casts are made from. Small rolls are readily available at craft stores. I happened to have a bunch lying around leftover from another project. 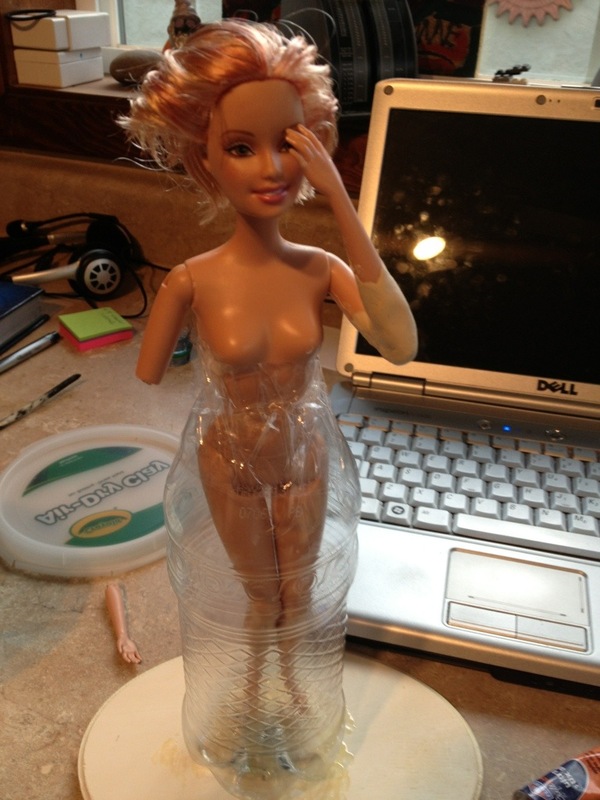 Once I got the Barbie all dressed, I realized that the bottle made her look pregnant. This is where the swearyness began. I ripped off the plaster, broke the bottle off the base, and discarded it. Plan B: A lump of clay and a large skewer stick for support. (Sorry about the terrible photo, but I think it’s clear enough for you to get the idea.) Once the clay cured (a couple of days) I ran a bead of Gorilla Glue around its edge to ensure that it did not pop off the base. 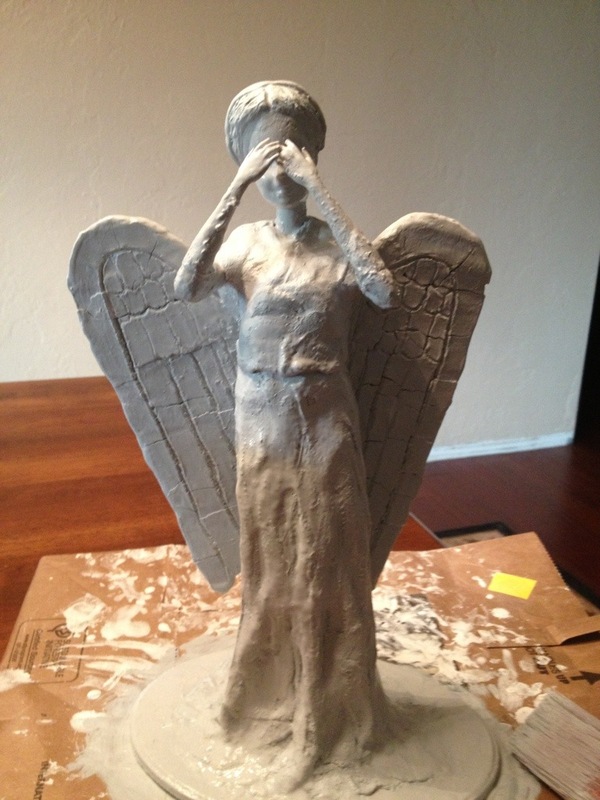 While I was reworking things, I decided to add clay to the wings in order to give them a more sculpted look. This was a great idea for aesthetics, but a terrible idea for my temper. The clay cracked as it dried which looked awesome except when whole pieces started falling off the foam core. I carefully glued them back in place, fitting them together like a puzzle. 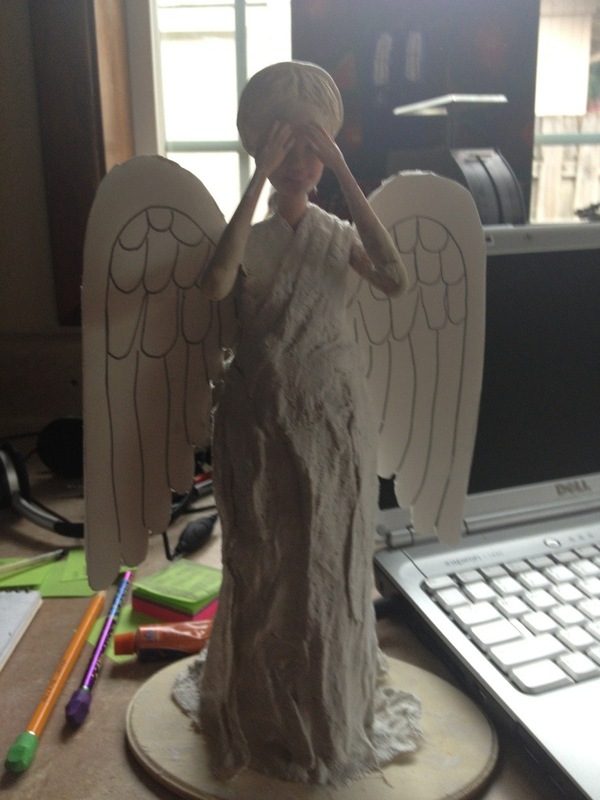 Anger making aspect number two: The wings were now too heavy to easily attach. 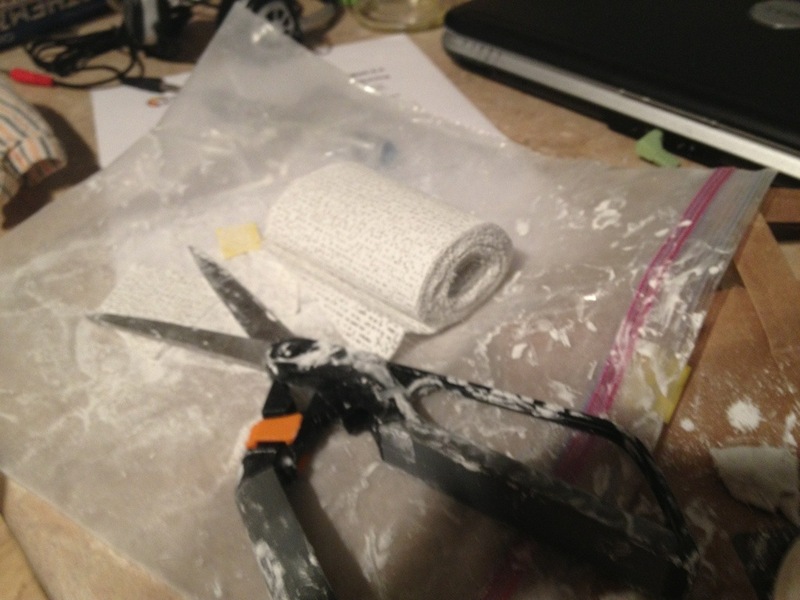 My glue needed time to cure and I could not hold them easily in place. I ended up having to use a lot of electrical tape in order to hold them steady while the glue dried. If I were to make one again I would craft the wings entirely from sculpty (oven dried clay), forming them to the contours of the doll’s back. 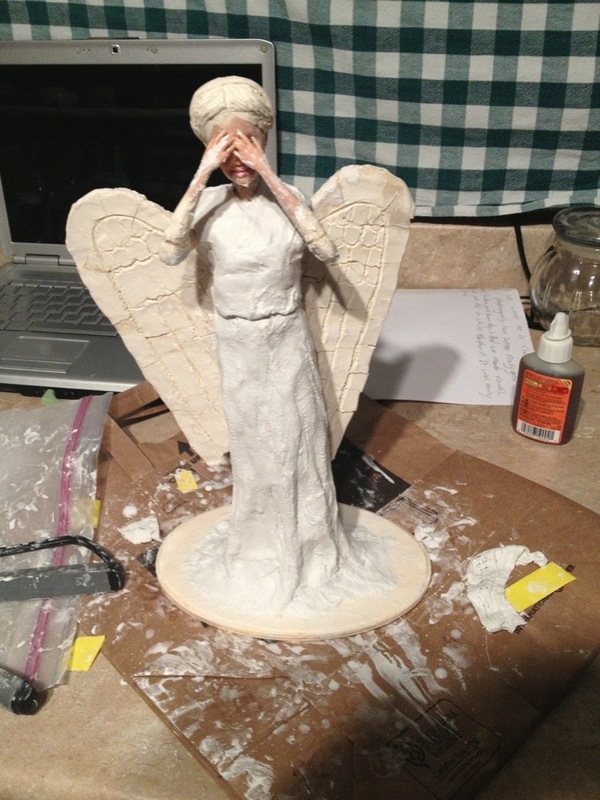 Once I finally got the wings to stay on the @%!# Barbie, I moved on to crafting her dress. This was one of my favorite parts of the process, second only to painting. The plaster fabric is quite easy to work with. Just cut to your desired size, dip in warm water, and apply. It is very mailable and therefore, easy to form folds and ripples in order to emulate real fabric. Make sure you do at least three coats for durability. 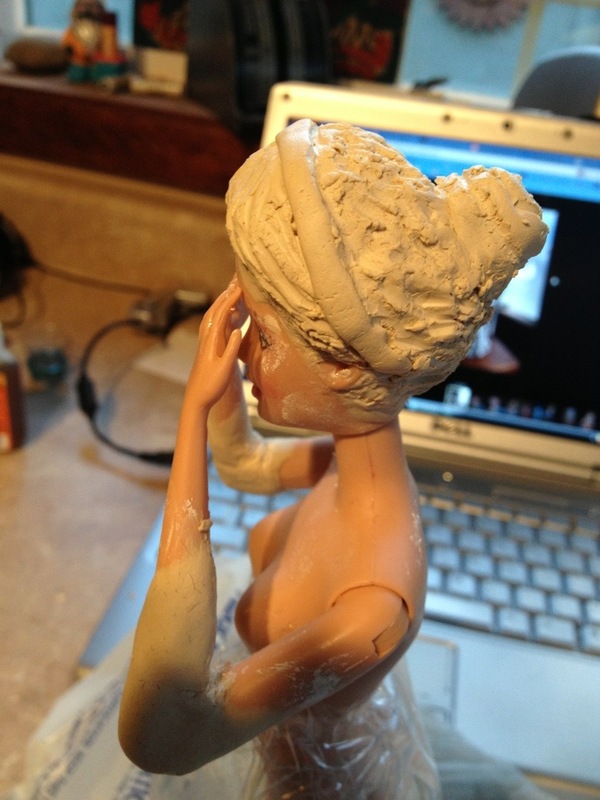 I also smeared a little of the plaster on Barbie’s arms and face to rough them up a little. Be sure to give ample time for all the clay and plaster to dry before painting–at least 48 hours. As a final touch, I used a mossy green color, to look like, well, moss. I stippled it on, sparingly, with a stiff brush, considering where moss would actually grow on a statue. 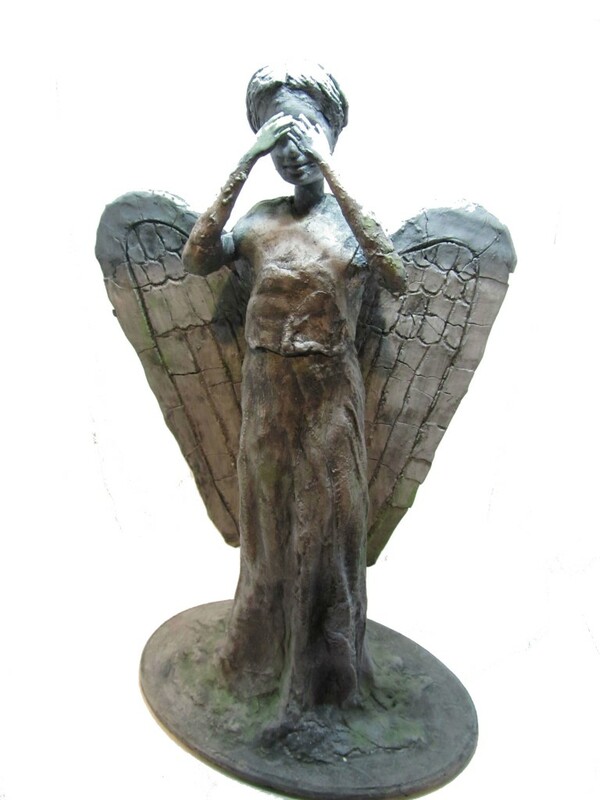 Here is a full shot of the completed angel. P.S. 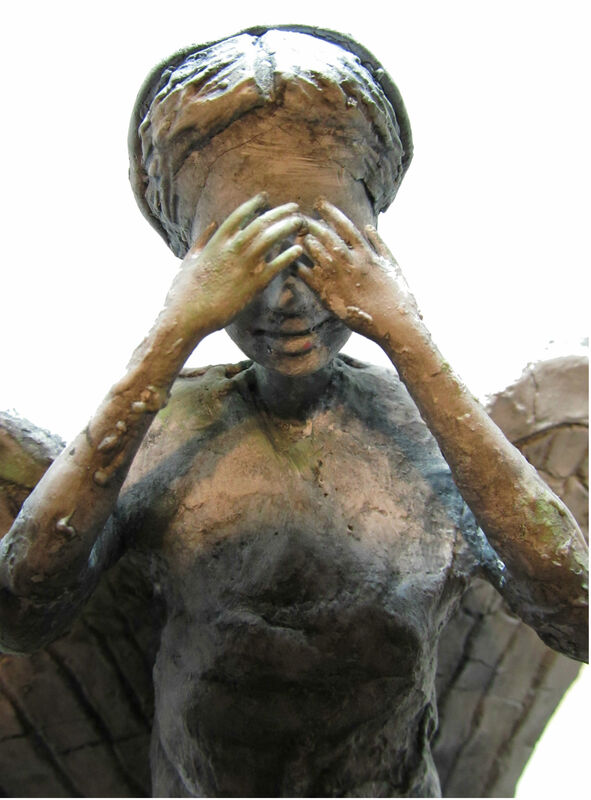 The Weeping Angel is a copyrighted character. Please feel free to create these dolls for your own terror and enjoyment, but do not sell them. 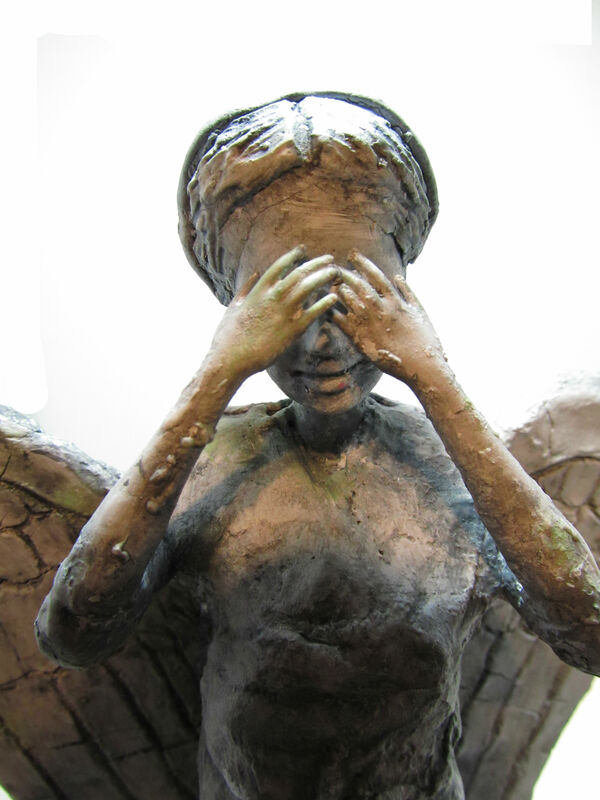 Additionally, I accept no responsibility for angel dolls or images coming to life and sending you back in time. I hope you enjoy 1941. 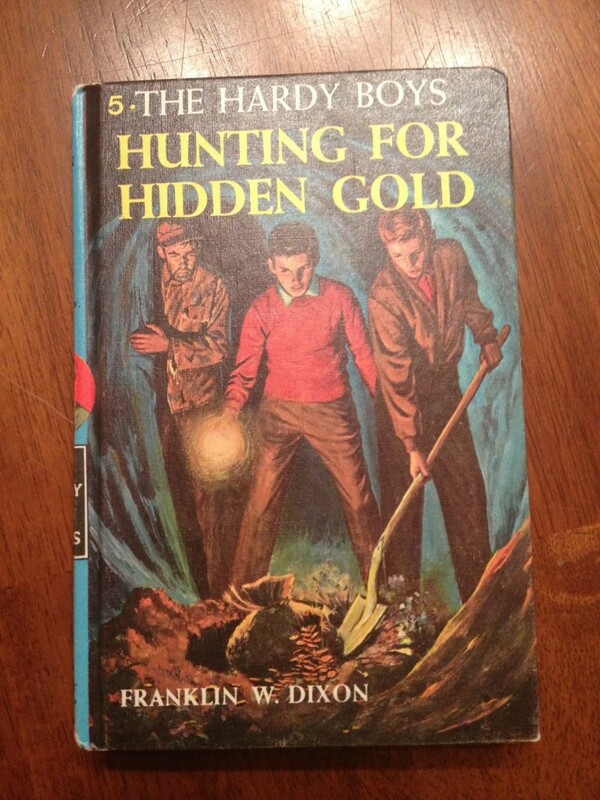 If you love books like I do you may be wondering about the title of this post. 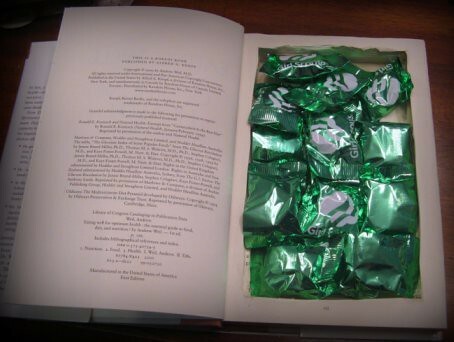 I mean, why shouldn’t you just give books? The answer: You should. Give lots of them. Especially to me. 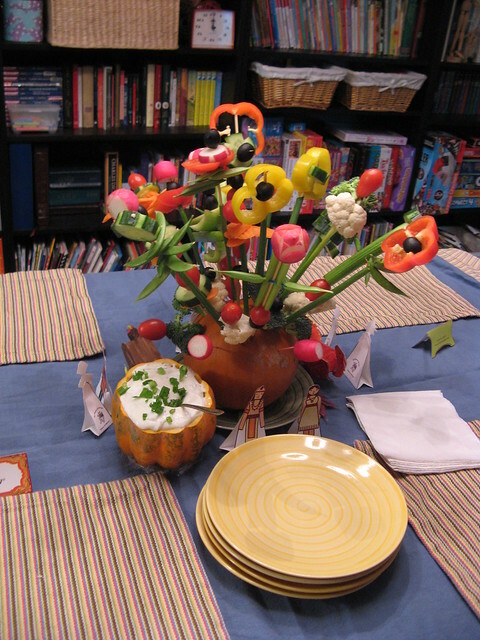 But, if you want to give something handmade*, you might like to try one of the following ideas. 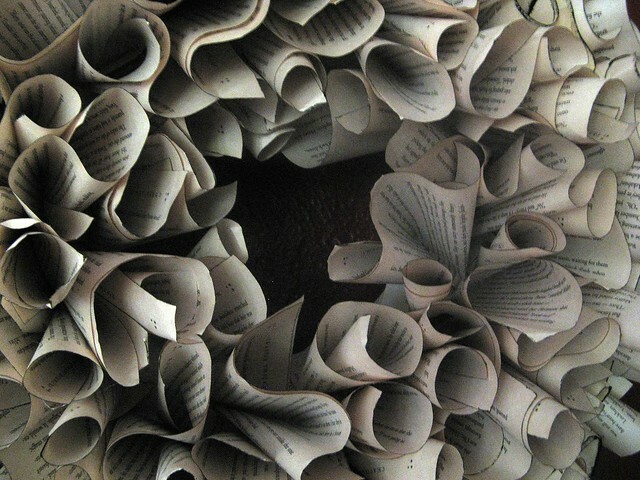 That is, if you can get past the wanton destruction of innocent books. I made these doodle pads for Newt for Christmas a few years ago. 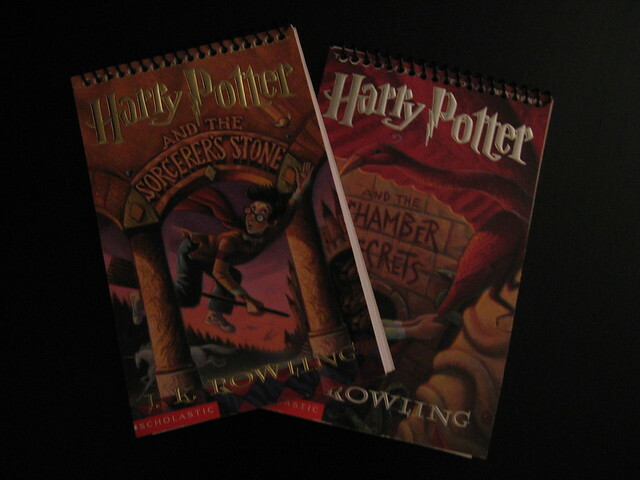 First I picked up a couple of used Harry Potter paperbacks and cut off the covers. Then I trimmed blank white paper to fit and had them bound at Kinkos. Easiest craft ever and she loved them. Win. Win. 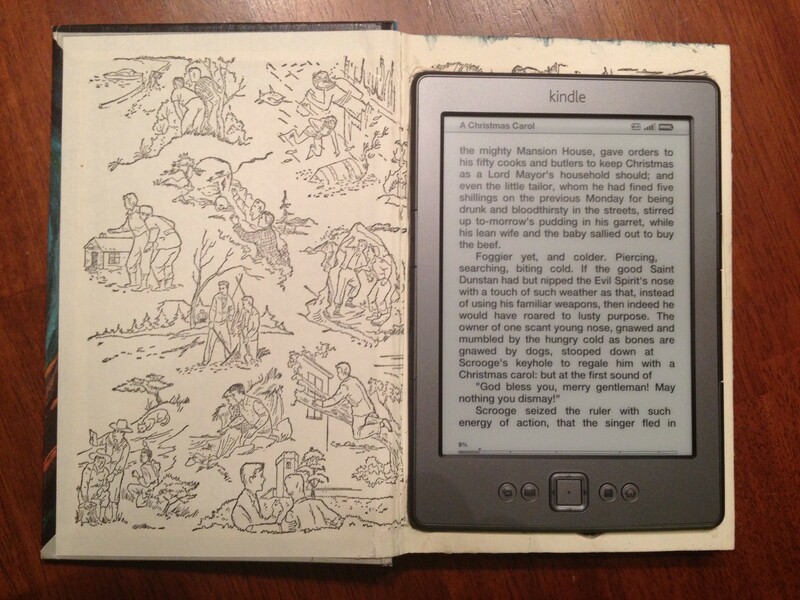 But what to do with all the pages? 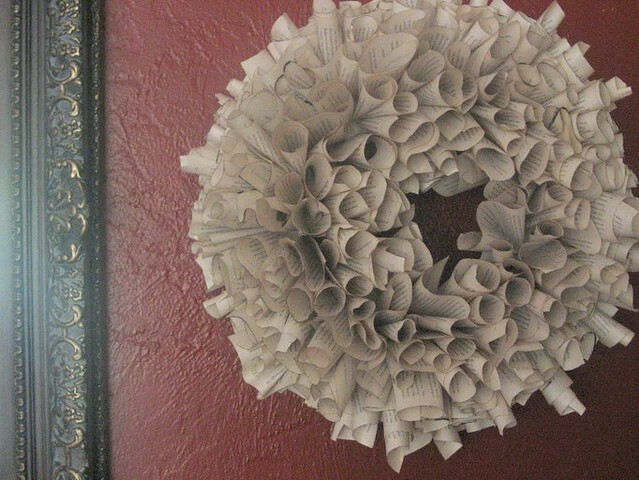 I made this wreath for my living room using these instructions. Wouldn’t that make a fun gift? 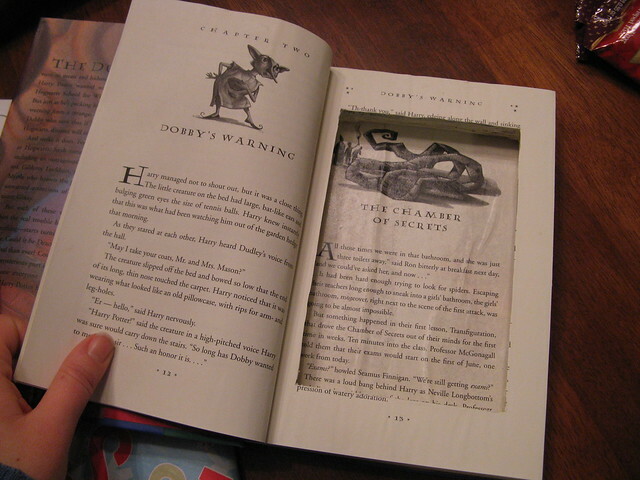 The site where I originally found book hollowing instructions no longer exists, but there are a lot of tutorials out there. 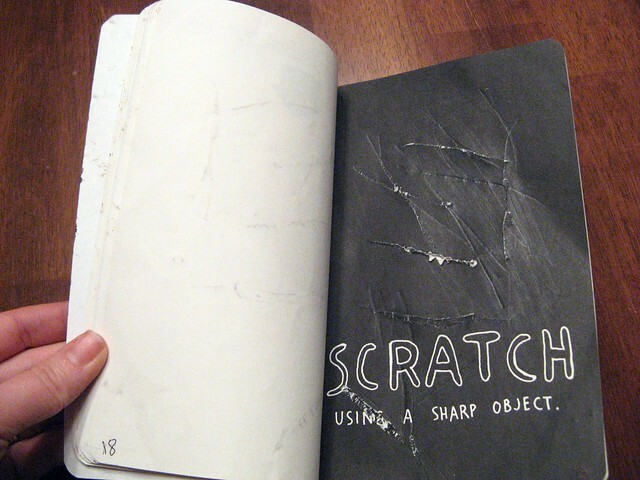 This one is not a craft, but Wreck This Journal seems to fit well on a this list. Newt loved her copy to pieces, quite literally. 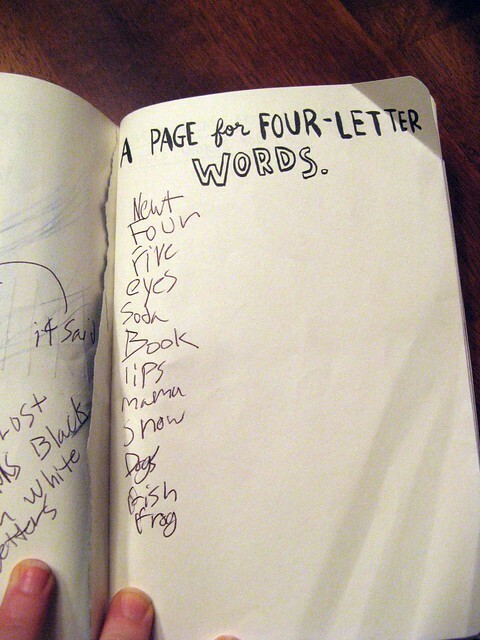 This is still my favorite page, though I think she may know a few more words she could add to it now. I wrote a whole post about it here. What do you think? Are you charmed by my crafty creativity? Or horrified at my destruction? What books would you like to creatively destroy? *We have a tradition of creating one handmade gift for each other every year. Come back Friday to see what I’m making Newt this year. Since I never post anything of interest on it, I am giving up my Frantically Simple Facebook page. You are all invited to subscribe to my author page instead, if you like. I hope to have good news to share there sometime in the near future. Sidebar link has been updated to reflect the change. Also: I have a Tumblr now. Chalking. Adorable form of self expression and so much nicer than a tattoo to the face. 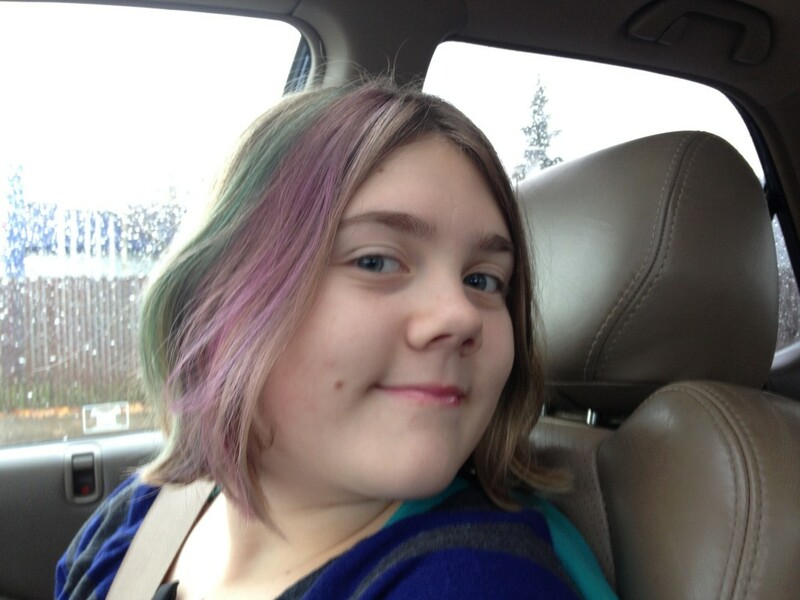 We use pastel chalks on dry hair. It washes out after one or two washes. Newt also wears lipstick and mascara now. She is really growing up. I really like who she is growing up to be. Or learn how to cook a turkey. Or learn how to ruin a turkey. Twice. 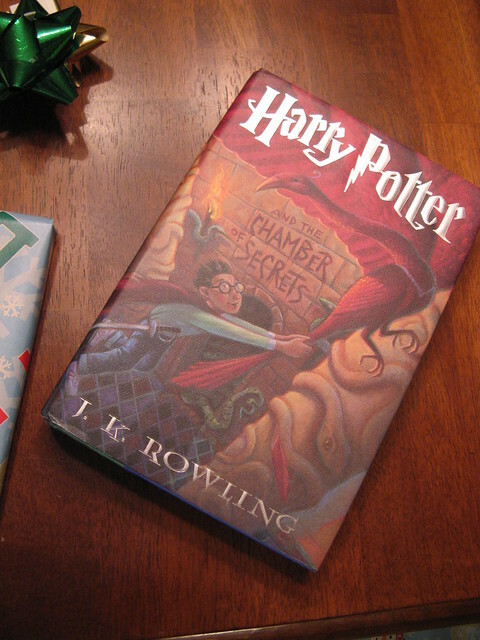 We don’t have books in the dining room any more, but maybe this is a mistake? Books should live everywhere! Speaking of Thanksgiving: I’m thankful for you! Besides the big night, Newt also has a costume contest for a 4H animal show she’s competing in. I have an only child. How is it that I am having to make three Halloween costumes? 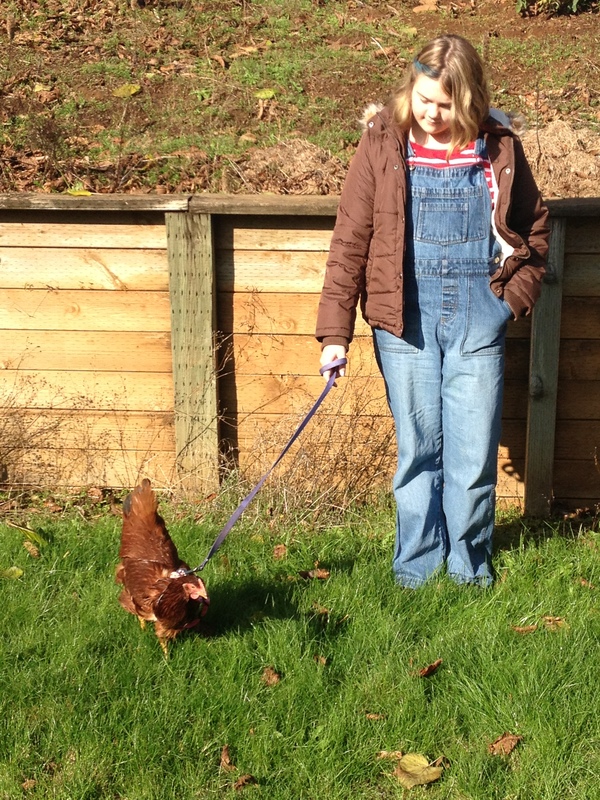 One for a chicken? Oh how I wish I were kidding. Sidenote: I just shampooed that rug and it looks terrible again. I thought of trying to edit it out, but there is a nasty rumor going around that I am perfect. Untrue, as you can now clearly see. Also: I have things currently growing in my fridge that may require a bio-hazard suit to safely dispose of them. And, I didn’t bother to wash my face in the shower this morning. 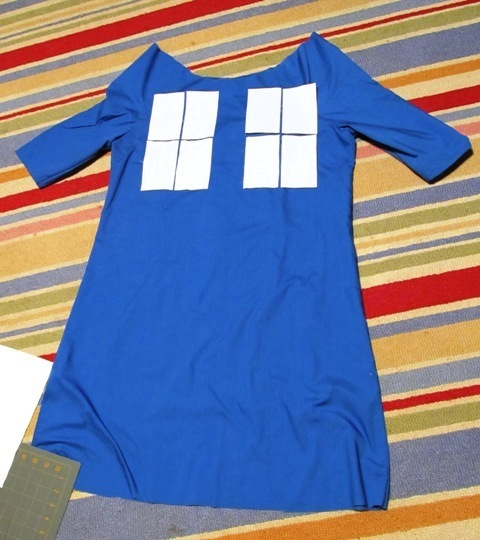 PS: If you like Doctor Who, check out our freezer paper stenciled tee-shirts, free printable Valentines, and Newt’s bedroom makeover.